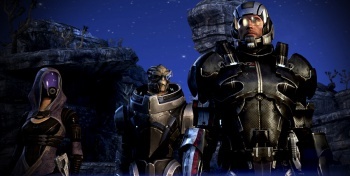 BioWare says it's "all hands on deck" for the next Mass Effect 3 expansion. Commander Shepard's story arc may be over, but the Mass Effect 3 DLC train just keeps on rolling. Omega launched last week, detailing the effort to retake the lawless space station from the forces of Cerberus, and now it sounds like the next expansion will be even bigger. "It's all hands on deck for this one. Pretty much every ME3 DLC writer here in Edmonton is involved. (which would include both Patrick Weekes AND John Dombrow)," level designer Jos Hendriks wrote on the BioWare forums. "If my math skills are correct, [that means] eight," he added in a later message. BioWare voiceover producer Caroline Livingstone, meanwhile, revealed on Twitter that Seth Green, the voice of Joker, had returned for another voiceover session, his first since the game launched. Raphael Sbarge, the voice of Kaidan Alenko, tweeted all the way back in October that he was back in the studio as well and since no squaddies appeared in Omega, the assumption is that the return was to work on the next DLC release. More recently, composer Sam Hulick stated on his own Twitter feed that he's also involved in the project. "What I'm up to lately: working on an unannounced Mass Effect 3 DLC! More details on this coming later on," he wrote yesterday. "High potential for tears." And speaking of "all hands," composer Sascha Dikiciyan clarified earlier today that he and partner Cris Velasco are working on the score too. "We and Sam and doing a 5050 split. It's more than the usual dlcs," he wrote. Neither BioWare nor EA have announced anything at this point but based on data gleaned from previous DLC releases, the next Mass Effect 3 expansion is expected to be centered on the Citadel.